Preparing your retail operation for long-term success means you’re likely elbow-deep in developing and implementing your holiday surge strategy right now. While your end cap displays are still months away from making their debut, your retail back room needs to be ready sooner than later to start taking on the increase in SKUs that comes with the holiday. A common problem we’ve seen in the past few years is a simple one, but one that has cost retailers almost $1 trillion (yes, with a T) in sales- out-of-stocks. One in three shoppers experience out-of-stocks on their shopping trips, a number that skyrockets around the holidays as retail supply chains struggle to keep pace with customer demand. These out-of-stocks are one of the major factors forcing customers to shift away from brick and mortar stores to online retailers, even if they prefer to shop local. Facing this challenge, retailers need to optimize their retail back rooms and reduce their dependency on distribution centers. That’s why UNEX has focused on making its Roller Rack solution the go-to choice for retailers who need to add high-capacity, efficient storage to their back rooms- and fast. 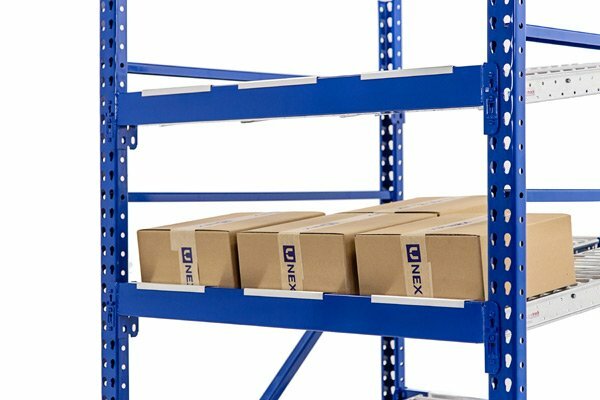 Storage density- Roller Rack allows you to store 7 times more SKUs than your standard pallet rack or steel shelving unit. This allows retailers to hold a lot more inventory in their back rooms and keep front-of-house shelves full for their perusing customers. Faster picks- Roller Rack comes complete with Span-Track wheel beds or roller lanes, which keeps product flowing to the point of pick. When your front-of-house shelves empty out, this allows your staff to quickly replenish them without wasting their time rummaging around deep in a rack looking for a product. Single source supplier- We supply the rack and the track, and do so with faster lead times compared to other suppliers. No shopping around for tracks that are compatible with your beam types- we’ve already handled that for you. Knock-down design- We pride ourselves on making simple solutions, and Roller Rack is no exception. Its knock-down design makes it easy to set up, use, and break down when the holiday surge subsides and you need to re-organize your back room. Modular design- Only enough space for a single bay? What if you want to fill the backroom with several rows? Roller Rack is designed to be flexible enough for both applications, which makes it a great fit for retail back rooms regardless of their size or layout. Whether it’s a big box chain or a local mom-and-pop, we’ve seen a lot of success with Roller Rack applications in retail back rooms. This solution is designed to make your out-of-stocks a thing of the past, and allows you to reclaim your chunk of that $1 trillion in lost sales. Contact one of our expert Pickologists today, and we’ll help you design a Roller Rack solution that brings the Power of Pickability to your retail back room.